I haven't made any Shrinky Dinks in very long time, but picked up some "Shrink Film" at JoAnn Fabrics the other day. I wanted to make some mushroom charms to go with a few other mushroom-themed pieces for a swap. Making the charms was so much fun! 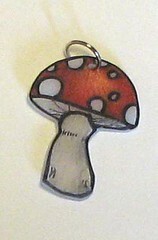 I just drew a mushroom, then traced it on the Shrink Film. I colored it in with Sharpies, cut it out, and then punched a hole at the top. It curls as it get heated and shrinks, so I kept flipping it from side to side to even it out. As you get it to its final size, it tends to flatten out. And if not, you can smooth it lightly while it's still hot. It shrunk quite a bit. I made the original drawings about 3 1/2 inches tall, hoping that wouldn't be too big. They shrunk to about 1 inch tall -- just about the size I was hoping for (or maybe a little smaller). Ta da! I saw all your mushroom and gnomes items on flickr! Gracious, are they cute, cute! !